The Pratt Community College men’s and women’s soccer teams have spent their spring semester using their talents to give back to local youth. Earlier this month, six players and two coaches traveled to Argonia, Kan. to put on a free youth soccer clinic. Approximately 50 kids were in attendance, and the clinic was deemed a huge success. Assistant Soccer Coach Mike Daniels noted that it was encouraging for rural towns to have such a showing of support for the sport. On March 23 and 24, the teams threw a similar clinic for the Pratt Recreation Commission. Even more youth showed up, with each day bringing in nearly 60 kids. Several of the players who helped with the clinics will spend the rest of the semester serving as referees during the kid’s spring soccer season. Community service is an integral part of Pratt athletics as it helps develop several service learning initiatives, and the coaches believe that the skills that are learned will help better serve their players later in life. 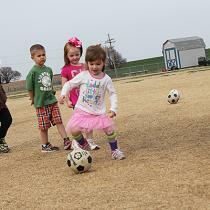 Soccer clinics are just one of the ways that PCC celebrates being part of the Pratt community. Our mission is maximum student learning, individual and workforce development, high quality instruction and service, and community enrichment. Each year, the members of the PCC family contribute more than 13,000 hours in community service and engagement to South Central Kansas. Our middle name is community.